There are many great exercises that will tone and lift your bottom, and happily, many of these can be done at home with little or no equipment. Your glutes are comprised of three parts: gluteus maximus, gluteus medius, and gluteus minimus. 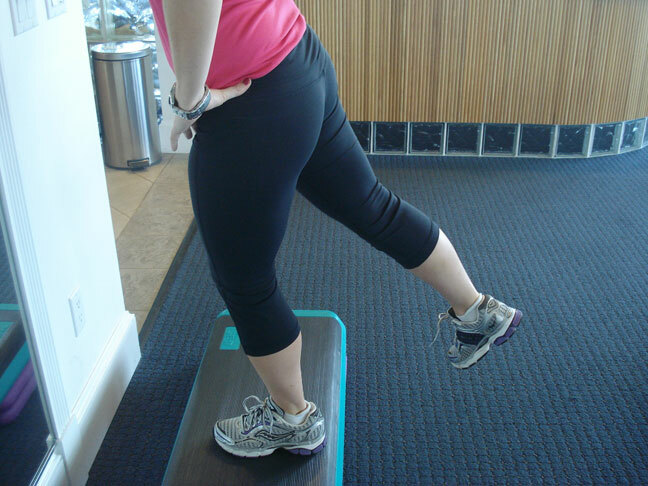 For maximum results, we want to focus on the gluteus maximus, as well as the hamstrings. This sounds far more fancy and complicated than it really is to execute you can check out the first image at the beginning of this article as an example of Part One of this exercise. Start by standing on a step. You can even do these off of a fireplace step while holding onto the mantel for support as your drop down. With your right leg, step backward off step onto the ball of your right foot and drop your right knee into a reverse lunge until it nearly touches the floor. Your left foot should still be planted on the step, left knee bending to accommodate the right leg as it lunges behind and drops down. Straighten left supporting leg again while bringing right leg back up until it is extended straight behind you, without arching your back. Squeeze your right “cheek” while right leg extended out behind you. Drop right leg immediately back into a squat. Repeat 8-10 repetitions on the right side, then switch and do the same on the left side. Try to do three sets. Begin on the floor on your hands and knees, hands directly under your shoulders and knees under your hips. Back should be flat and parallel with the floor. Keeping knee bent, lift your right leg off the floor and elevate that leg, aiming the bottom of your right foot toward the ceiling. Raise your leg only as far as you can without arching your back. Hold for a count of two at the top. Lower right leg back to starting position, stopping just before knee touches the ground, and then raise right leg again. Repeat right side 10 times before switching to the left side. Aim for three sets. Think of the motion as a count of two at the top, and a count of one at the bottom to achieve the right rhythm. Lean back into a wall, feet flat on the floor, toes facing out, and hands resting on your hips. Slide down into a squat until your knees are at ninety degrees and you are “sitting” in an imaginary chair. Your knees should not extend past your toes in the sitting position. Slide back up the wall until you have returned to the original starting position. Repeat 10 consecutive times for three sets, resting between each set, as needed. To make this move more challenging, or to increase the benefit, do this exercise while holding 5 or 8 pound weights in each hand at your sides. Put gravity to work and use your body weight to get the “bottom” line results you want right at home. Doing these three simple exercises twice a week is an excellent way to get a jump start on great glutes.